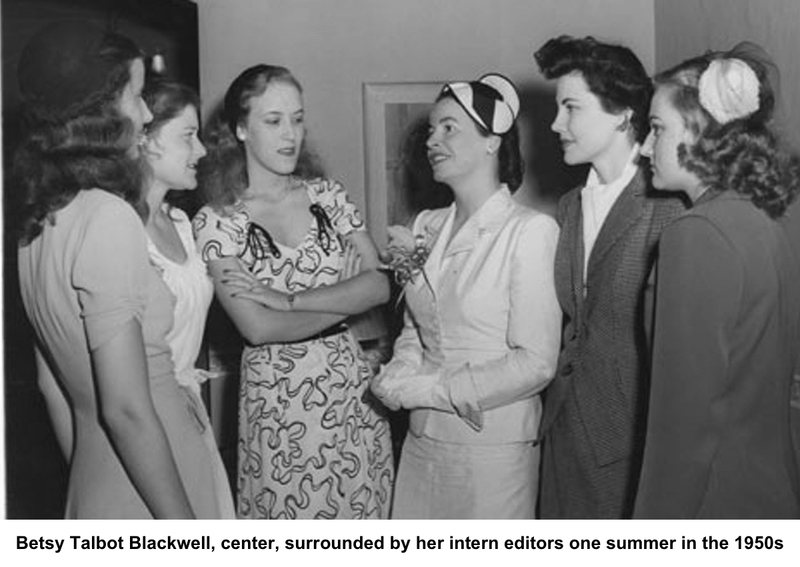 Betsy Talbot Blackwell was one of the 20th century’s top women’s magazine editors, leading Mademoiselle from 1937 until her retirement in 1971, and quadrupling its circulation. In the process, she refashioned not only her publication, but the field of women’s magazines. “Her attention to the college and young career women was so successful that other fashion magazines, like Vogue, Glamour and Harper's Bazaar, began to imitate Mademoiselle’s youthful format,” The New York Times once reported. Betsy Talbot was born in Verona, N.Y., in 1905, the daughter of a fashion-expert mother and a writer father. Her mother, Benedict Talbot, was a well-known fashion stylist for such retailers as Macy, Gimbel, Saks, and Lord and Taylor. Late in life, she lived at The Elms Inn on Main Street where she died in 1974. Betsy Talbot was educated at a convent school. When still a teenager she began writing about fashion in 1923 and soon was assistant fashion editor at Charm magazine. In 1935, she joined Mademoiselle, then brand new. Under several noms de plume she was editor of four sections, including fashion. Two years later, she was named editor in chief. In aiming her magazine at college students and graduates, she created the “college issue,” in which she would bring in a group of college-age “editors” each summer to create the September issue. Among the many interns who worked on these issues was the poet Sylvia Plath, whose novel, “The Bell Jar,” was modeled after her experiences under Blackwell. Under Blackwell’s leadership, Mademoiselle’s circulation rose from 178,000 in 1939 to 540,000 in 1953. During her career she had many accomplishments and earned many awards. She was a Woman of the Year for the American Women’s Association, and was profiled in the 1984 book, “Wise Women: Singular Lives That Helped Shape Our Country.” She was the first and only woman on the board of directors of Street and Smith, the magazine publishing company, and was once the only woman director of the Hanes Corporation. She was also a director of the Columbia University School of General Studies. She was married to James Madison Blackwell III, a Wall Street lawyer, who died in 1961. Ten years later, she moved to West Lane to be closer to her son, James M. Blackwell IV, then a Newsweek executive and Ridgefield school board member. She died in 1985 at the age of 79.